Orchestrate and automate real-time context based customer engagement for your customer journey. Customers must not only be retained as active subscribers, they need to be converted to advocates. This can be achieved through targeted marketing campaigns and tactics, orchestrated to encourage customers to adopt more valuable services and take advantage of upgrades. The opportunity lies in driving greater lifetime value from the existing customer base, by encouraging customers to consume more and to stay longer. It can be a challenge to engage with customers in a relevant manner when the customer relationship is often a one-way street and operator brand perception and exposure is low. No organization is likely to have the manpower to support one-to-one customer relationships. Mobilethink Customer Engagement makes sure mobile operators never miss an engagement opportunity by scaling up their efforts through automation. Designed to help mobile operators better engage with customers during the subscription life-cycle, increase customer lifetime value and maximize the output of their marketing efforts. Timing is essential for relevant customer engagement and successful sales conversions. Mobilethink Customer Engagement solution provides the ability to deliver messages to your customers at the relevant moments, rather in scheduled batch deliveries. It is based on real-time device detection which triggers the customer engagement process should the subscriber fall in any of the predefined segments. The starting point for efficient and relevant marketing is customer segmentation based on rich data. For example – device capability, subscription, billing and location data. When the exact device capabilities of a subscriber are combined with his currently subscribed services, it opens up various upsell opportunities. In addition, the more accurate and rich the data is, the higher the chances are for successful upsell.  Mobilethink Customer Engagement solution combines real-time device detection with data collected from various sources, such as CRM, subscriber profiles, billing center, location information, device capability data, etc. The engagement processes are created and orchestrated in a graphical wizard tool. An easy 3 step process takes the user from defining the customer segments to choosing the engagement event triggers all the way to setting the engagement action and content smoothly and quickly. 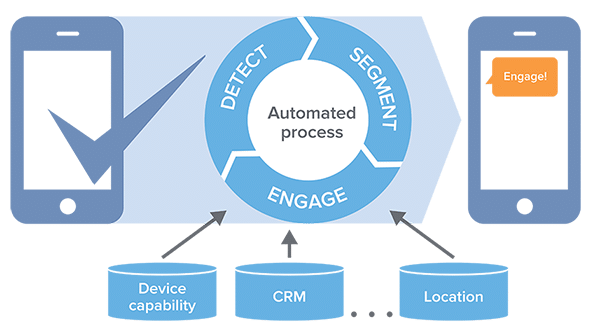 Engagement processes are then automated so that the customer engagement actions are performed at the triggering events on real-time whenever a device and a subscriber belonging to a segment is detected. Automation ensures that no upsell opportunity is ever missed! Mobile operators’ engagement efforts can easily fail, if they choose to broadcast one-time efforts to a mass population, using static customer profiles and having no visibility at the device level. 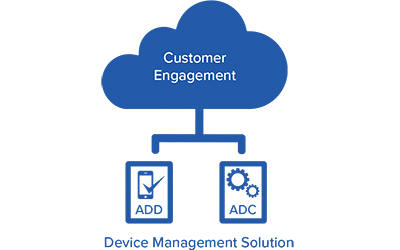 Enghouse Mobilethink Customer Engagement helps operators orchestrate effective customer engagement processes by capitalizing on real-time network triggers, accurate device capability points and subscriber behavior data. All this information is captured from the deployed Enghouse Mobilethink Device Management.